Forbes Magazine – World’s Best Beach Resort and Travel & Leisure – World’s Best Service Awards. Set in a stunning rainforest with themed restaurants, swimming pools (including the largest swimming pool in the Southern Hemisphere) and cocktail bars scattered throughout the resort. On the southern side of Hayman there is a man-made harbour with the entrance marked by six beacons. Permission to enter the marina can be granted by the marina office on VHF channel 16/10. Day visitors are permitted to stay between 1000 and 1500 hours at a cost of $145.00 for a vessel and two passengers ($35.00 per person thereafter) and are required to purchase lunch at one of the resorts restaurants. Pre-booking a berth is essential, as Hayman will only accept two vessels per day. The resort facilities include, fuel, water, rubbish disposal, nurse, a dive shop and of course the restaurants. Please also note that a dress code does apply to all guests. 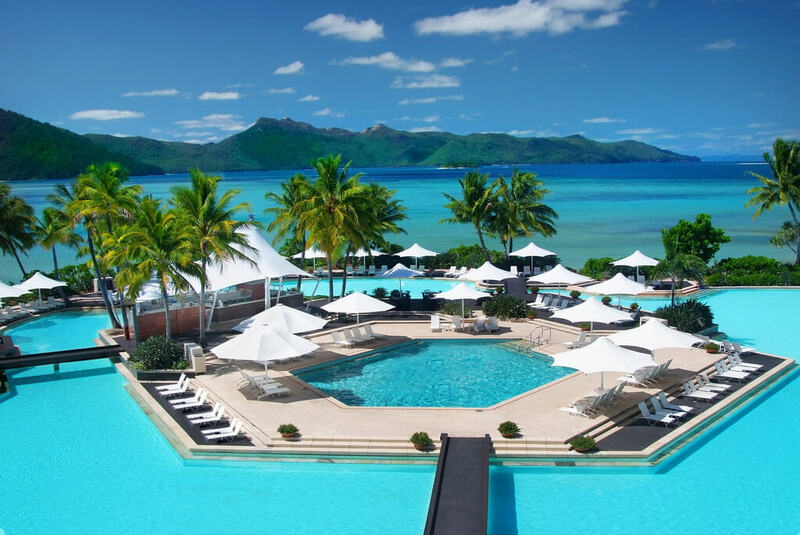 If you would like to make your stay at Hayman Island Resort a longer one, accommodation must be booked in the resort. No guests are permitted to stay overnight on their vessels. There is a truly outstanding range of accommodation available on Hayman Island, starting from around $185.00 per person / per night. Hayman Island is also home to one of the Whitsundays most popular dive and snorkelling locations, the famous Blue Pearl Bay. Blue Pearl Bay is not the easiest place to anchor. There are five reef protection buoys located off the fringing reefs which you must anchor outside of to reduce damage to the reef. At the northern end of Blue Pearl Bay you will find Dolphin Point which is considered one of the best dive locations in the Whitsundays. Blue Pearl Bay is also accessible from the resort via walking trail or the Resorts own water taxi. When sailing around to Blue Pearl Bay, do not attempt to pass between Hayman and Arkhurst Islands but navigate around the South Western side of Arkhurst. Navigation on the southern side of Hayman Island, between Hayman and Hook Islands, can be difficult as there are many hazards to negotiate. Recently though, many beacons and lights have been installed, helping to make the passage safer.